Jajpur is an important tourist spot in Odisha. Not only religious people but also researchers, political people and general tourists come over here form the time immemorial. We have no detailed records of the past but it is of course, known form history and traditions that many people visited Goddess Biraja and Jajpur in the past. As Jajpur or ancient Biraja was the capital of different ruling dynasties, the kings and emperors might be visiting Goddess Biraja during their tenure. The literary account conveys that the great Nātha teachers like Matsyendranāth and Birupakshnāth had visited Goddess Biraja. The Bhaumakara rulers are known to have been the devotees of goddess Biraja .They were having darsan of the Goddess almost daily.Padmasambhava a Buddhist monk had attained Siddhi (fulfillment of desire) after penance near Goddess Biraja. 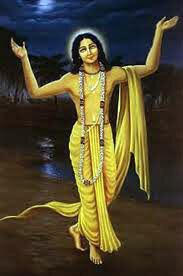 Sri Chaitanya (1510 AD) a great saint and seer had visited Goddess Biraja during his visit to Jajpur. 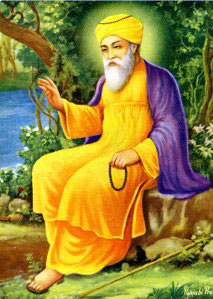 Guru Nanak (1506 AD) is said to have visited the temple during his travel from Bengal to Puri. 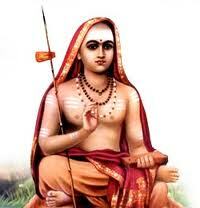 Yayāti Keshari of the soma dynasty was a great devotee of Goddess Biraja and was the son of the soil. There is a legend that Yayāti Keshari was residing inside the temple premises before his coronation to the throne. Padmapadācārya (the then Sankarācārya of Govardhan Pīṭha, Puri) had become his advisor for constructing a temple for lord Jagannath and converting Jajpur to a Saiva Kṣetra. During the Ganga and Gajapati rule Chodaganga Dev and Pratāparudra Dev might have visited Biraja temple as we come across an inscription of Chodagangadeva here and construction of Sri Varāha temple by Pratāprudradeva at Jajpur. Since the time of Yayāti Keshari there was a tradition of the meeting of Gajapati king of puri and Sankarācharya of Puri on the Hera Panchami day during car festival at Puri in the Biraja temple Primises.The tradition has since been discontinued .The marhatās were great builders and revivalists of Hindu temples at Jajpur. Raghuji Bhonsale, the marhatā subedār is believed to have visited the Biraja temple during the 18th Century AD. Many Saints and Seers like Achyutānanda Dās and Bāyā bābā are known to have visited the Biraja Shrine. Mere over during the British Period and Post-independence period many scholars like C.S. Banerjee, Bankim Chandra , Radharaman Das, Armustrong, Markham Kettoe, Thomas Motte, John Lekie, Durati Barbosa. R.D. 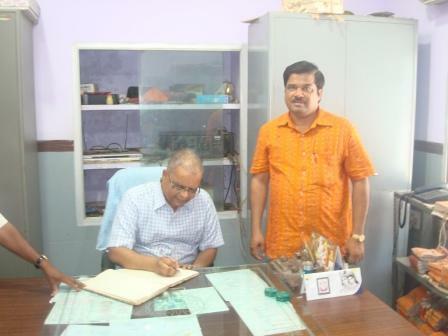 Banerjee, M.M Ganguly, R.L. Mitra, N.N. Vasu, D.C. Sircar and K.C. Pānigrāhī have visited the Biraja Shrine.It is a legend that the king of Nepal had also visited Goddess Biraja. Above all many unnamed visitors from far and near visit Goddess and offer piṇḍas to their ancestors near Nābhigayā, through the centuries past. Accommodation for Tourists- Facilities are available for tourists and devotees in the Biraja Panthasala beside the Biraja temple for staying. The outside visitors may opt for P.W.D. Bungalow and Circuit house in Jajpur town. Star hotels are available at Jajpur Road, Cuttack and Bhubanesvara for foreign tourists. They may travel to Jajpur from the above places and come back. 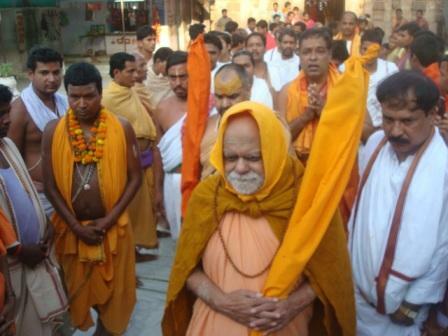 His Holiness Jagatguru Sankaracharya of Govardhan Math of Puri visited the Maa Biraja Temple on-25.04.2012 and performed puja and obtained the blessings of Maa Biraja. Sri Ramroop Jaganath, a Mauritian citizen of Jajpur origin had finally searched his ancestral home at Nuagaan under Korai Block and reached Maa Biraja Temple on-08-12-2012 and offered Pinda/Sradha at Navigaya and performed Puja and obtained the blessings of Maa Biraja. Chief Secretary Odisha Sri Bijaya kumar Pattanaik IAS has visited the Temple of Maa Biraja on – 24-12-2012 performed puja and obtained the blessings of Godess Maa Biraja. Smt.Usha Devi, Hon. 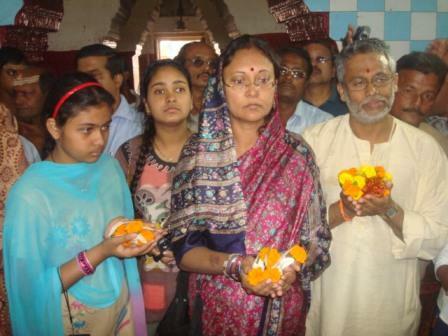 Minister, Women and Child Development, Department,Govt of Odisha visited the Maa Biraja Temple on-09.01.2013 performed puja and get the blessings of Maa Biraja. 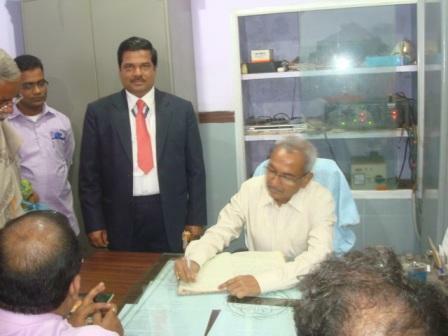 Justice S.Gobinda Raju Sitting Jugde of Andhra Pradesh High Court visited Maa Biraja Temple on-12.05.2013 along with his family performed puja and get the blessing of Maa Biraja.